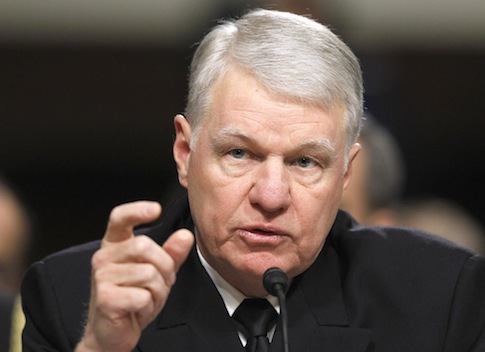 The former chief of naval operations said a United States military strike against Iran would be difficult because of the size of the country and the distances to targets. Retired Adm. Gary Roughead, who stepped down a year ago as the top Navy officer, expressed concerns about the consequences of a U.S. or Israeli attack on Iran’s nuclear facilities. "I think a military strike into Iran would set off a whole set of events," he said when asked about a possible Israeli or U.S. strike against Iran in the coming years. Roughead made the comments following a speech to a conference at the Hoover Institution in Stanford, Calif.
"I would submit that the Iranians understand power and that needs to be brought to bear," he said. "I would say when people talk about strikes into Iran on the nuclear facility, it would be a delay. …"
The retired four-star said Iran is "very different than Iraq and Afghanistan and is huge in size by comparison, with more than 650,000 square miles of territory." "It’s hundreds of miles from the northern Arabian Gulf to where the nuclear facilities are, so as I say you’re in Indian Country for a long time. And it’s not an easy thing to do," Roughead said. "So, more pressure, but I also believe we need to open up some more dialogue with them." War drums have been sounded in Israel in recent weeks as the country’s leaders debate whether to continue a covert action campaign to disrupt Iran’s drive for nuclear arms or to conduct military attacks that likely would involve the U.S. eventually. Iran has an estimated two-dozen nuclear-related facilities that would be targeted in a military strike. Many of the facilities are in underground bunkers that are difficult to target. The nuclear facilities and the country at large also are protected by sophisticated anti-aircraft defenses that would make a military strike complicated. One weapon likely to be used is the Air Force’s recently deployed 30,000-pound precision-guided bomb, called the Massive Ordnance Penetrator, which is capable of bombing targets protected by 200 feet of concrete. Strikes on Iran would include bomber and jet fighter attacks from U.S. aircraft carriers in the Persian Gulf. The U.S. currently has two carrier strike groups near Iran. The subject of Iran’s nuclear program was discussed during the presidential debate Tuesday. President Barack Obama repeated his claim that Iran will not get a nuclear weapon as long as he is president. GOP nominee Mitt Romney criticized the president’s policy during the debate by saying that Iran has grown closer to a nuclear weapon in the past four years. Romney said if he had been president he would have imposed tougher sanctions earlier than the Obama administration. Romney also promised tighter sanctions, including the blocking of ships carrying Iranian oil from coming in to U.S. ports, and moving against companies that trade in Iranian oil. "And of course, a military action is the last resort," Romney said. "It is something one would only, only consider if all of the other avenues had been tried to their full extent." Roughead, in his remarks, also said not enough has been done to pressure Iran’s leadership. "I do believe there is more that we could do to Iran," he said. "Everybody is focused on the sanctions. But I really think that we could bring more pressure to bear on the leadership, particularly the [Islamic] Revolutionary Guard [Corps] leadership. We haven’t pressed them hard enough, we haven’t pressed the Qods Force hard enough." The IRGC and its paramilitary Qods Force are Islamic shock troops that play a major role in Iran, both in the developing nuclear weapons program and in that nation's international support for terrorism. Under the Obama administration, Treasury and other sanctions have been imposed on IRGC leaders with little effect since the sanctions prohibit financial and business activity that critics say have little impact on the group. The first U.S. sanctions on the IRGC and Qods Force were imposed in October 2007 for their support for global terrorism. Additional sanctions were imposed in April 2011 in an attempt to punish the group for supporting Syria’s crackdown on protesters. This month, four senior Qods Force officers were sanctioned for their role in last year’s foiled plot to assassinate Saudi Arabia’s ambassador to the United States. According to a recent report by the Council on Foreign Relations, the IRGC "has evolved into a socio-military-political-economic force with influence reaching deep into Iran's power structure." IRGC involvement is unprecedented since the group was formed in the aftermath of the 1979 revolution and "its control of strategic industries, commercial services, and black-market enterprises, has evolved into one of the country's most influential domestic institutions," the report said. Pentagon spokesman George Little said in response to Roughead's remarks that the United States has applied significant diplomatic and economic pressure on Iran including unprecedented sanctions. "The way to come out from under that pressure is [for Iran] to abide by their international obligations," Little said. The Qods Force has around 1,000 operatives and has been in charge of exporting Iranian Islamism throughout the Middle East. Qods units also are assisting the embattled regime in Syria of Bashar Assad. On China’s military buildup, Roughead said China is building a navy and military that will give them greater options for using force. "It’s still very regional," he said. China’s military "went to school" on the U.S. military, learning from the speed and lethality of U.S. operations in Iraq beginning in 2003. China also was "heavily influenced" by events in the Taiwan Strait in 1996 when Beijing fired test missiles north and south of the island state and the U.S. responded by sending two aircraft carrier strike groups to the region. "I think those events told them that they were never going to be put in that position again, so they started to apply the technology, a lot of it reverse-engineered" from the West, he said. Currently, China is advancing to the point where a lot of their arms are being developed indigenously, he said. "We haven’t been asleep at the switch on our ability to deal with some of the capability they have," Roughead said. The U.S. and China need to come to terms on how to coexist peacefully. "But at the same time it will be a competitive race," he said. This entry was posted in National Security and tagged China, Iran, Middle East, Sanctions. Bookmark the permalink.